The World Happiness Report is an annual publication of the United Nations Sustainable Development Solutions Network. It contains articles, and rankings of national happiness based on respondent ratings of their own lives, which the report also correlates with various life factors. In July 2011, the UN General Assembly adopted resolution 65/309 Happiness: Towards a Holistic Definition of Development inviting member countries to measure the happiness of their people and to use the data to help guide public policy. In 2012 this was followed by the first UN High Level Meeting called Wellbeing and Happiness: Defining a New Economic Paradigm. which was chaired Bhutan then adopted gross national happiness instead of gross domestic product as their main development indicator. There is no correlation between the size of the population or the happiness score. The U.S. by far exceeds the happiness score of all others. India has the lowest happiness score. The disparity between the U.S. wealth per adult or GDP per adult and all other countries is even greater except that the happiness rankings for China and the U.S. are comparable whereas the difference in wealth is ten-fold. The range in disparity in happiness is dramatized by comparing the #1 ranking country and the bottom ranking #155. The differences in happiness are enormous. It just happens that a large number of bottom ranking countries are small in population. With a few exceptions (e.g. the U.S. and China) more than 80% of the global population can be considered substantially or materially unhappy. Of course none of that applied to the 0.5% of the global population with income over $1 million. The implications of such enormous differences are far reaching. With the rapid dissemination of information about the unhappy conditions of most mankind the question can be asked whether the existing acceptance of poverty and unhappiness will remain acceptable to the under-privileged. In the same way as the dangers of global warming have emerged only in the last two decades, we can now anticipate the rising effects of immigration from poor and impoverished countries to the islands of prosperity, e.g. the U.S., Canada, Australia and Europe. In the next century we can see a breakdown of the international order that was based largely on the dominance from British post-colonial countries. With easy access to communication technologies an weapons it is unlikely that well over five billion poor people will remain socially and politically indifferent to continue with the status quo. (1) See: https://worldhappiness.report/ed/2018/ for 2018 Report. In 2018 there were 176 countries with 4,920,175,000 adults out of a total global population of 7,597,175,530. 35% of that number was under 18 years old. Adults are concentrated in the richest countries whereas children constitute a large share of the population in the poor lands. In the next postings we will discuss only the adequacy of adult earners. 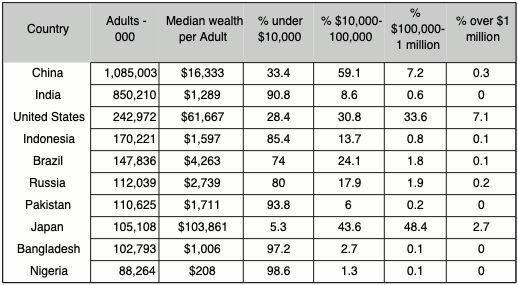 There are only two wealthy countries: Japan with mean wealth per adult of $103,861 and the US with mean wealth per adult of $61,667. The difference between these countries can be seen from the poverty line. The US has 28.4% of its population earning under $10,000 whereas in Japan only 5.3% of the population earns less than $10,000. Countries living under poverty conditions are: India (90.8% earning under $10,000); Indonesia (85.4% earning under $10,000); Brazil (74% earning under $10,000); Russia (80% earning under $10,000); Pakistan (93.8% earning under $10,000); Bangladesh (97.2% earning under $10,000) and Nigeria (98.6% earning under $10,000). The only exception is China, with 33.4% of the population earning $10,000 and rising. In all other cases, whether for the wealthy or the poor, the levels median wealth per adult did not rise much. Iceland and Switzerland with a total population of 9 million show a clear indication of wealth. 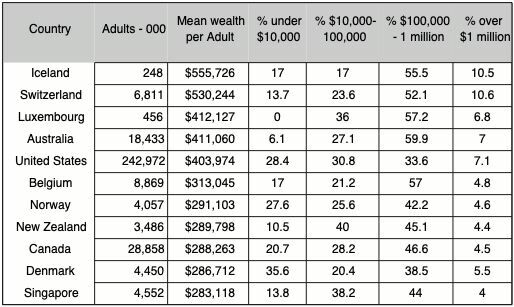 The % of the population with wealth over $100,000 is over 66% whereas the % of the poor population is very small. Standing out is the United States, Norway and Denmark with their respective % of the poor is over 28% even thought the % of the super-rich is high. We can consider Luxembourg, Australia, Belgium, New Zealand and Singapore balanced nations with a solid middle class. 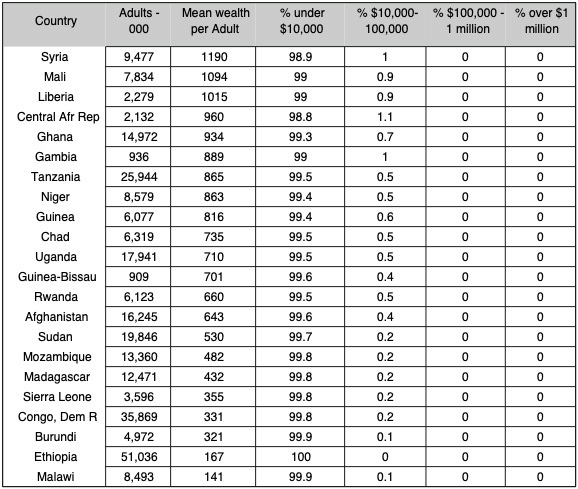 Nevertheless the top ranking wealthy nations represent only 7% of the global population of adults. The total population of these impoverished lands is 275.4 million. When children are added they equal the population of the USA. 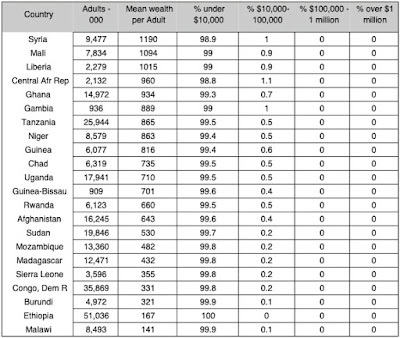 Of the largest populations in the world only the USA and Japan are wealthy. Recently China was gaining, but they need more time to catch up to classify itself as wealthy. China's poverty level ratios are comparable with the USA. Its current prosperity is concentrated on a middle class but is lacking a share in the number of millionaires. The world's second largest population - India - is now desperately poor and is likely to remain in that position in the foreseeable future. None of the other countries, by population size - Indonesia, Brazil, Russia, Pakistan, Bangladesh and Nigeria - can be expected to rise to a position of economic leadership in the immediate future. From the standpoint of an expanding global economy only the USA and possibly China in the future can be expected to take over the task of leading the world's economy. Japan remains as a candidate, but its demographic limitations will continue to impede its position as a leader. The top ranking wealthy countries are small in population and do not operate as sufficient economic base to lead the expansion in the global trade. However, their specialization will make them prosper through global trade. There is a very large number of bottom ranking impoverished countries. By population they account for 2,252,074 adults, or 46% of the total. With the current decline in the economic power of the USA and with the uncertain prospects about the rise in China's economic power, the 2019 global outlook has too many risks for making a forecast about an optimistic future of an increasingly prosperous world to come. The entire wealth pyramid, from the less affluent groups at the bottom up to the wealthiest individuals at the top shows an enormous disparity. The 3.2 billion adults with wealth below USD 10,000 account for 64% of all adults, but just 1.9% of global wealth. In contrast, 42 million millionaires comprise less than 1% of the adult population, but own 45% of household wealth. China is now firmly established in second place with respect to the number of dollar millionaires (behind the United States and above Japan) and in second place also (above Germany) with respect to the number of ultra-high net worth individuals. Global risks are intensifying but an overall perspective of well-being is lacking. Instead, daily conflicts are now hardening. The world appears to be moving into a new phase of state centered politics. The idea of “taking back control”—whether domestically from political rivals or externally from multilateral or supranational organizations—resonates across many countries. The energy now expended on consolidating control is weakening global challenges. What we are lacking is an evaluation from a historical perspective. How far has mankind progressed so far as compared with conditions over a generation ago? What we know about the current status is received from the TV and newspapers. However, what we see is only improvised turmoil. How can we judge what are the current the conditions of human progress while the advent of a post-industrial civilization is supposed to be taking place? Is there a "clock" that would keep a record of human progress? Perhaps the best we can do is to measure current conditions that depend on public metrics such as wealth, health, life expectancy and a newly developed index of happiness. 1. Only the U.S. holds the highest happiness score, the highest GDP/adult and the highest wealth/adult. 2. The next GDP/adult ranking countries, Brazil, Russia and Mexico have on 18% of the U.S. GDP/adult. 3. Pakistan, Indonesia, Nigeria have low happiness scores and low GDP/adult. 4. India, Central Africa and Bangladesh are impoverished. 5, China is rising in Wealth/adult, but not enough. The dominant position of the U.S. by every metric we have examined confirms it unchallenged global position. There are small countries such as Norway, Sweden, Monaco or Switzerland that show superior ranking as compared to the U.S. but we have omitted them from a scoring of global conditions.